Visit one of our outdoor living Design Centers! 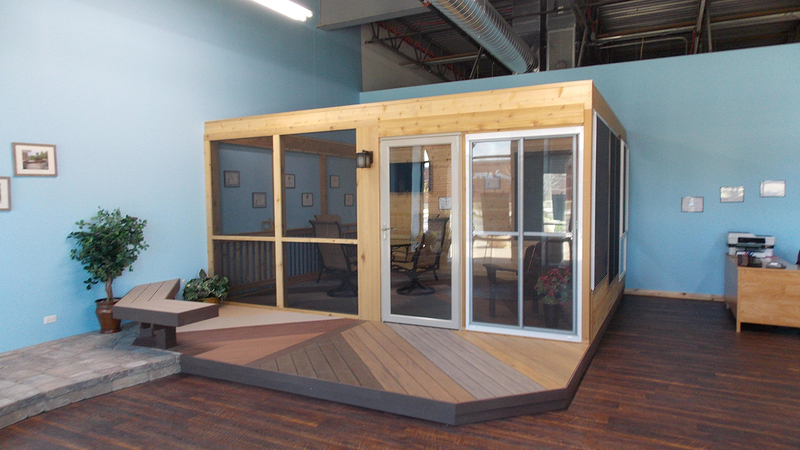 At Archadeck of Chicagoland, we design and build a custom space for every one of our clients. Whether you’re looking for a deck, porch, patio, pergola or other structure, there are a number of design considerations and likely many material options available. One of the best ways to put together your perfect design is by visiting one of our design centers. We know the importance of seeing the different material options and seeing them in use and not just in a tiny block of wood or tile that serves as a color sample. When you work with us, we invite you to meet with us in one of our two design centers. These comfortable design inspiring spaces help us work collaboratively to identify the absolutely best project for your Chicagoland area home. Read about and take a look at images below for a virtual tour. Give us a call to discuss your new project and come visit a design center to plan and dream together. 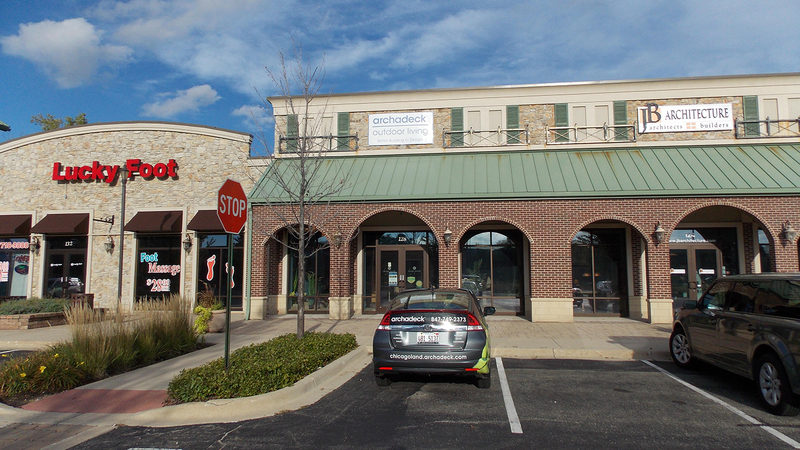 We recently moved our Rolling Meadows Design Center to a beautiful and spacious new Design Center in Palatine. Located on West NW Highway, you can see a fully built patio, pergola and screened porch along with material samples galore. 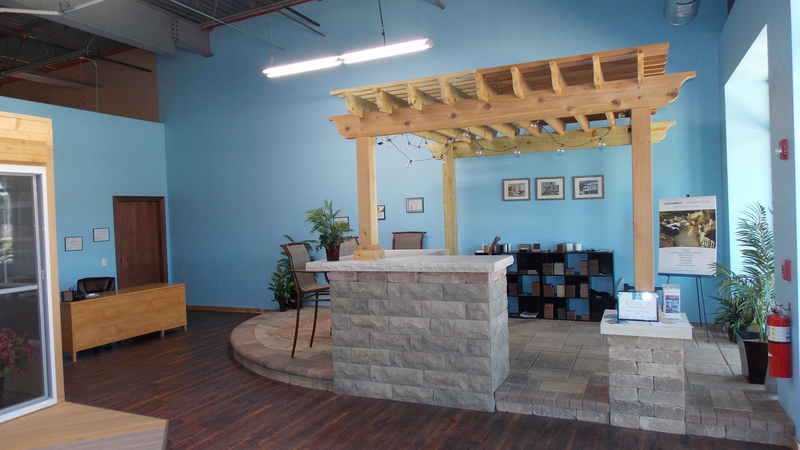 When you first enter the Palatine Design Center, you’ll notice an array of flooring materials used throughout. Whether you’re considering Exotic Brazilian hardwood, TimberTech low maintenance, AZEK PVC decking or another material, you can see the options here. What about custom design options such as a floating bench to create a natural rail for your deck? Take a seat and see how you like it! In our full-sized screened porch, take a look at many different flooring samples installed in a herringbone custom installation style allowing you to see our craftsmanship while seeing the huge variety of low-maintenance decking. 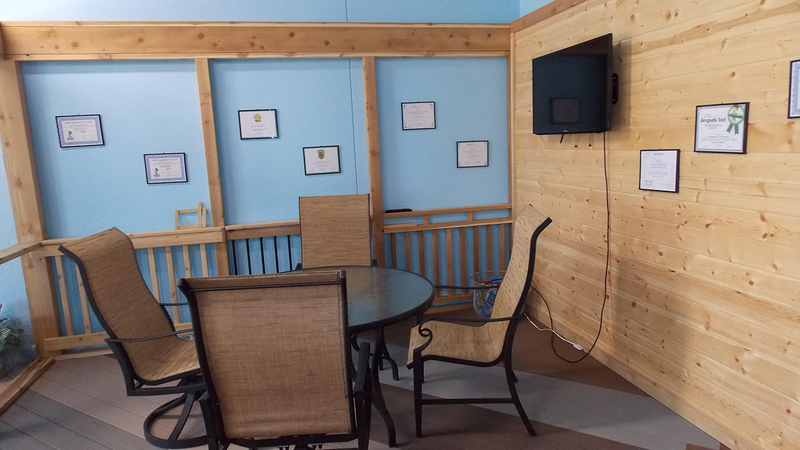 Are you thinking about a rustic screened porch with a cedar wall? Take a look at that in action to. How about railing or a kneewall? What do those look like? Nothing needs to be left to the imagination. Just turn your chair around to see a number of design techniques and materials in action. After scheduling your appointment and driving over to the design center, you’ll see a custom trellis flanking the door to the building along with the blue “Outdoor Living Showroom” sign. When you come for your design meeting, sit in a full screen porch, build with different and very popular materials. See and touch different materials as they will look in your new outdoor space. 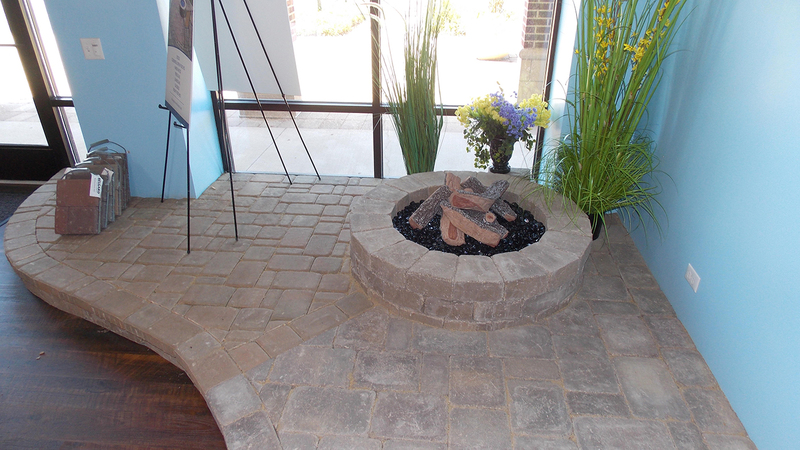 If you’re considering a paver patio, take a look at different pavers and stones right at the design center. This makes it easier to make key decisions about the materials for your new outdoor space. When you sit down with your consultant, take advantage of their experience. 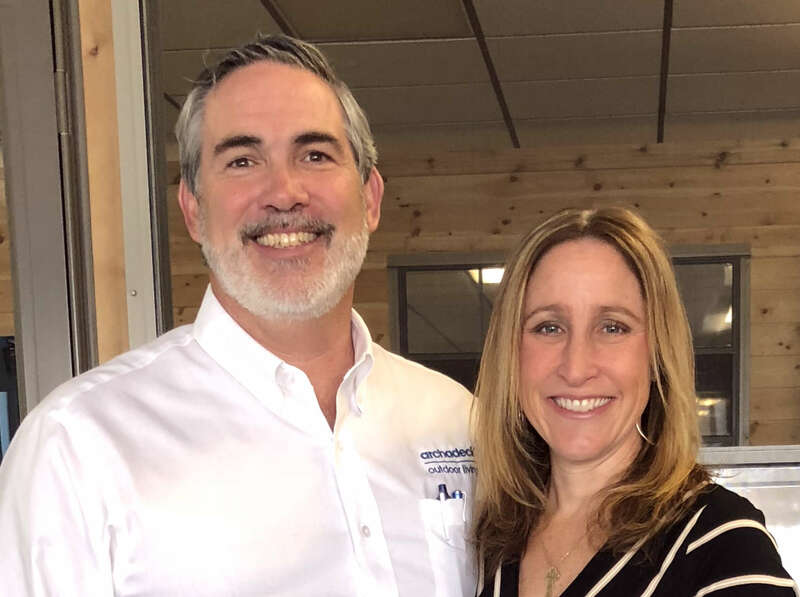 Archadeck has been in the Chicagoland market for 25 years and we’ve built hundreds of projects. We are able to help you match your wants and needs with design features and specific materials. We look forward to your design appointment. 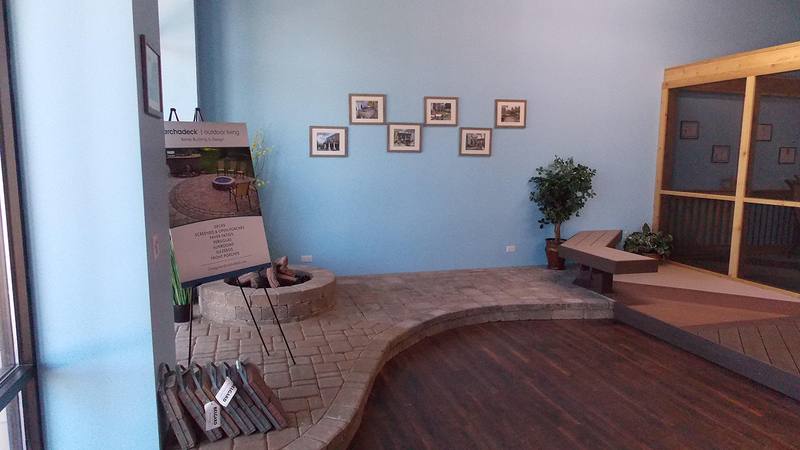 If you’re considering an outdoor space, we would love to meet with you at our Naperville Design Center to discuss transforming your backyard.